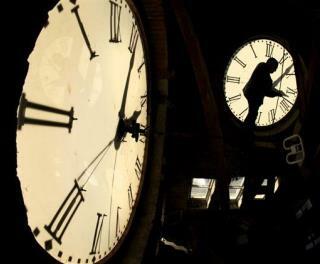 (Newser) – Daylight Saving Time starts Sunday, but no one benefits from it, writes Bora Zivkovic in Scientific American. It will take days for our bodies to adjust to the lost hour—we're essentially "jet-lagged for a few days"—and even cows will suffer when they're milked an hour earlier than they're used to. And for what purpose? DST was established back when lighting was the biggest energy need, so changing the clocks to maximize daylight hours saved electricity. Nowadays, that's no longer true. Far more stressful are the career druggies living in the apt. below mine who make crystal meth morning, noon & night. I'm exhausted most of the time just trying to blow their toxic smoke back to them with fans & blowers, steam cleaning the inside of the floor to prevent the toxic meth stench from building up & flushing the drains to neutralize the caustics they continually throw into the plumbing. Try working full-time to save enough to move, after >3 yrs. I find that to be almost impossible & have to work per diem. It's sickening. Equally stressful is trying to enlist the help of apathetic police & gov't "officials" who apparently could care less. So apathetic are they, another meth lab opened up just 5 blocks away & in my travels as a per diem worker, I see that they're popping up all over NYC. But who cares? I guess that it will take a few good explosions & some dead folks to snap them out of their torpor. Yeah, that time shift twice a year is the only time that I get so stressed that I can't control my urge to kill people!